Jan 19, 2019, ECLOF India – Malliga, 38 years old, stems from a remote village in Kanchipuram district in the South of India. She and her husband have a 9-year old daughter, Nisha. With only basic education and married at an early age, Malliga’s struggle began early on in life. Before she set up her own business, Malliga’s family depended on the meagre and unsteady income her husband made as a farm coolie. In 2001, Malliga joined the “Ellaiyamman Mahalir” self-help group for women started by ECLOF in her village. Through the group, she participated in training on thrift, savings, adult literacy, silk weaving, and women’s empowerment. 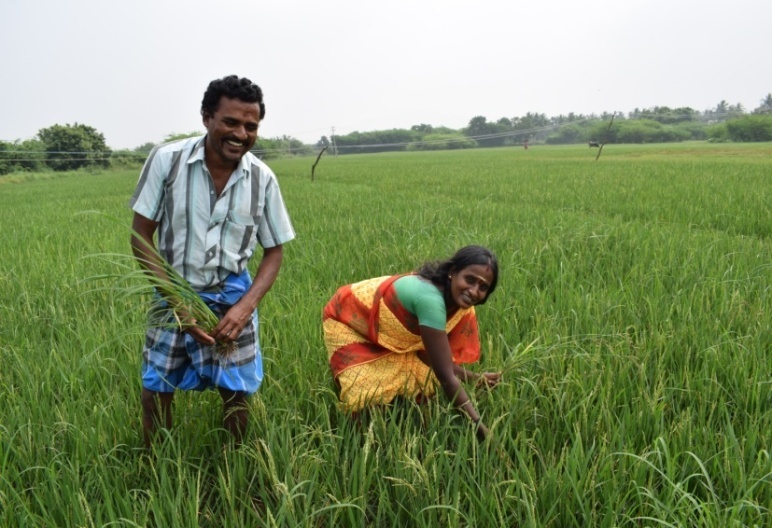 With new found confidence and an ECLOF loan, she set out to grow their family rice farm. Over the years, it grew from one to six acres. Worked by Malliga and her husband, the farm generates much-needed income for the family. Part of the income, they invested in dairy cows. With a loan from ECLOF, they constructed a cow shed and today own four cows. 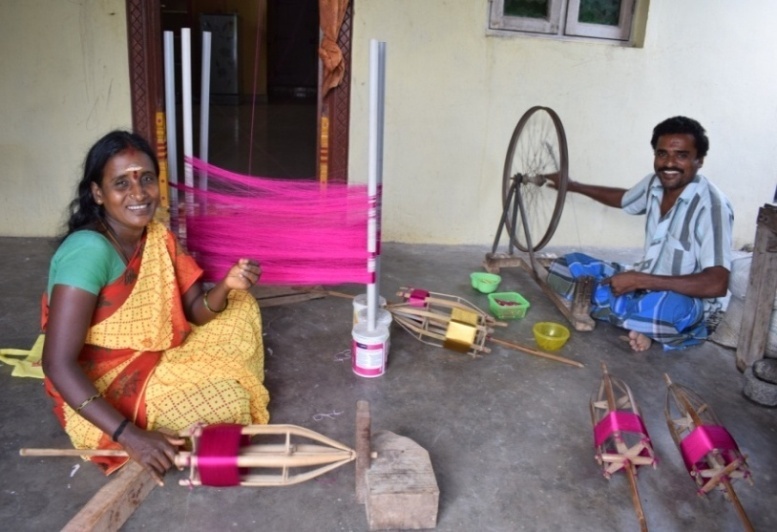 Recently, Malliga and her husband started an additional business: producing silk sarees. Kanchipuram is known for its rich weaving tradition and Malliga has been familiar with weaving since her childhood. With a loan from ECLOF, the family bought a silk weaving loom. Silk yarn is supplied by local cooperatives. Every month they weave 3 to 4 saris which are then sold via the cooperative. The latest business Malliga pursues is chicken rearing. She has applied for a new loan from ECLOF to build a henhouse and buy chicks. Today, the family eats three nutritious meals a day and sends their daughter to a good nearby school. The income from the businesses has allowed the family to replace their old coconut leaf thatched house with a concrete one. Malliga is respected as an empowered woman in her family and village.